How to clean silk scarves? If it is conditional, it is best to dry clean. After all, silk is more delicate. Dissolve the detergent thoroughly in warm water of about 20 degrees Celsius and wash it by hand. Remember not to machine wash.
First test the fading. Apply a small amount of water to the inconspicuous area of the silk scarf and press it with a white towel. If there are some faded scenes, avoid washing. Agile rinsing after folding. 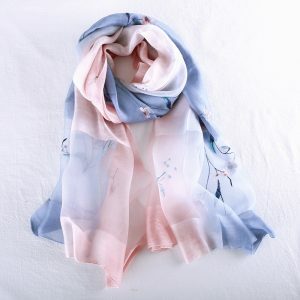 The silk scarf is folded regularly, and then the fold is fixed by hand to be put into the water, and the surface dust is rinsed back and forth. Wring out in a folded condition and rinse again after spreading. Then change the clean warm water and repeat the process twice. Spread the silk scarf with a towel. Rolled up along the margin to fully absorb moisture. After removing the water, spread the silk scarf thoroughly, hang it on the hanger, and place it indoors without sunlight. Avoid sun drying for a long time and drying with a dryer to avoid fading and yellowing, and the fabric is aging.